How Can I Prevent Daily Bloating? Feeling a fullness or tightness in your belly, passing gas, or even needing to unbutton your jeans by the end of the day? Bloating is an uncomfortable symptom. It's also one of the facts of life during menopause for many women, especially those who often felt it during their menstrual cycle in previous years. Fortunately, unless your bloating is being caused by something far less common and more serious, there are a variety of ways to combat this discomfort. Fluctuating hormone levels can wreak havoc. In the case of bloating, both increased and lowered levels of estrogen can bring on the feelings of a tight tummy - bad news for those in the perimenopause stage, when both these things often occur. Higher amounts of progesterone causes water retention; lowered amounts of estrogen result in less bile, a substance that lubricates the intestines and prevents small, hard stools from building up. In addition, midlife changes also mean your body is more apt to convert calories into fat, especially in the abdominal cells. This predisposition to weight gain, especially around the belly, aggravates fluid retention and the feelings of bloating. Many women taking hormone replacement therapy (HRT) have also been known to complain of this side effect. A diet higher in healthy fats, protein, and low-glycemic-index carbs can do wonders for belly pain, quickly relieving heartburn and indigestion. Doing so will not only keep your metabolism up, but it will also help you feel fuller for longer, potentially aiding in the process of weight loss. In addition, it will allow your system to digest more efficiently. Eating large amounts of food - even healthy foods - also increases insulin levels, which, in turn, produces copious stomach acid and makes the feelings of bloating worse. It may seem simple, or even counterproductive in the face of fluid retention, but don't underestimate this natural wonder. Water flushes out waste from the body and could go a long way to provide intestinal relief. Alcohol is an irritant to your abdominal processes, and caffeine also has its adverse effects. See if eliminating or greatly reducing them from your diet will help keep your belly happy. These foods, such as beans, soft cheese, broccoli, pears, cabbage, corn, oats, onions, apples, and potatoes, induce bloating in many people. 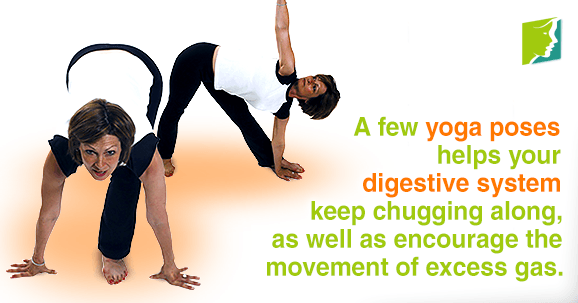 Participating in a little bit of daily exercise or even a few yoga poses helps your digestive system keep chugging along, as well as encourage the movement of excess gas. Exercise can also relieve stress; too much stress negatively effects your body. Lying down on a full stomach can easily produce acid reflux and make your intestinal issues worse. Give at least a two hours to digest after your last meal before sleeping.If you experience prolonged or intense discomfort, speak with your healthcare provider. Bloating is a pain, but relief can soon be yours after trying out some of the suggestions above. Peace of both belly and mind are within reach. For further information on how to handle daily bloating follow the link below. Northrup, Christiane. (2001). The Wisdom of Menopause: Creating Physical and Emotional Health During the Change. New York: Bantam Dell, pp. 230-231. During menopause, both weight gain and abdominal bloating become more prevalent. Read on to discover 4 ways to distinguish between the two. Bloating is a common symptom of menopause, but it can be relieved naturally. Click here to learn more. Bloating is a particularly frustrating symptom of hormonal imbalance, both for its visibility and hard-to-predict nature.